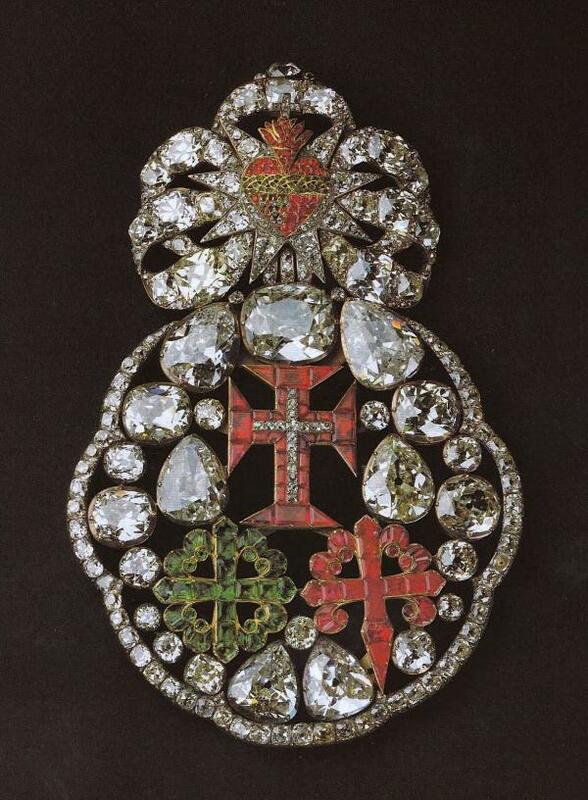 Prior to the discovery of the maritime route to the Orient, the variety and quantity of the gems used in Portuguese jewellery were limited. It was only after that discovery in the late 15th century, that the panorama of jewellery making changed. Another significant change occurred as a consequence of the discovery of diamonds in Brazil in the 1720’s. The massive quantity of diamonds contributed to a trend in design where the set gems completely covered the jewels. Moreover, around the 1750’s, the brilliant cut started to become the most popular diamond cut. The last development relates to “new” coloured gemstones that also came from Brazil in this period. Topaz, from the Ouro Preto area, would be the most important. Yellow-green chrysoberyl also made a huge impact and local amethysts became popular. Some colourless gems like quartz, topaz and beryl, fashioned as diamonds, were low cost materials set in silver jewellery to simulate the more expensive diamond-set pieces. This availability of colour is expressed in the Portuguese jewellery manufacturing of the late 18th century and early 19th century and a clear change in jewellery design may be attributed to this gemstone availability.